Colds can make young children feel quite miserable. On average, children catch a cold three to eight times a year, and the symptoms can last for three to four weeks (although they're worst in the first two or three days). So, it can often feel as if a preschool child is constantly unwell with a cold. Here is some advice about what to do if your child has a cold, and information on using cold medicines for children. What causes colds and what are the symptoms? Colds are caused by viruses infecting the upper airways (nose, sinuses, mouth, throat, and voice box). They are not caused by bacteria, so antibiotics will not treat a cold. A child with a cold might also have a fever, mild body aches, mild headaches, and less energy than usual. How can I stop my children from getting colds? Unlike influenza (flu), there is no vaccination for colds because they are caused by many different viruses. You can help your children avoid colds by teaching them to wash their hands before eating or preparing food, and not to share cups, drink bottles, or anything they eat or drink with. They should also wash their hands after they have touched their face. Also teach your children to cover their mouth and nose with a tissue or their arm (but not their hand) when they sneeze or cough, and then to wash their hands afterwards. Keeping your home warm and dry and being smokefree also help to stop your children from getting colds. How long do colds last and does treatment shorten them? Most people get over a cold within one to two weeks, but the cough that goes with a cold can last up to four weeks. Click on the image to the right to see how many children still have symptoms after five or 10 days. they may cough up mucus (phlegm) that is first white or clear, but then pale green or yellow. These changes are normal. They do not mean your child needs antibiotics. There are no treatments that will make a cold go away more quickly. But your child's immune system should fight it off within one or two weeks. Antibiotics will not treat a cold and may cause side-effects such as diarrhoea (the runs), thrush, and tummy aches. Giving antibiotics to a child when they don't need them makes it more likely the child will develop a bacterial infection that is resistant to antibiotics. This could make it difficult treat to any bacterial infections they get. What are the best ways to manage cold symptoms? Give your child paracetamol and ibuprofen to help relieve aches, sore throats, ear ache, and headaches. They can also bring down a fever. Carefully follow the instructions on the label about how much medicine to give your child, and how often. The mixtures for children come in different strengths. Take care to use the correct amount for the age or weight of the child. If you're not sure, talk to your pharmacist. Get your child to drink plenty of fluids. Your child may need more water because of a fever. Being dehydrated will make them feel even worse, so drinking plenty of water will help. Give your child a warm bath or shower before bed. This may make their congestion better for a while, without the side effects of decongestant medicines. Using a humidifier in their bedroom can also help. Use saline nasal drops or spray. These are particularly useful for thinning mucus and unblocking babies' noses. Babies have difficulty breathing through their mouth until they are toddlers, so congestion can make it hard for them to sleep and feed. You can buy drops or sprays from a pharmacy, or you could make your own saline rinse and apply a few drops to each nostril, using a syringe. Make sure you read the advice on using over-the-counter cold medicines for children. have had a wet-sounding cough for four weeks or have had a cold for four weeks and still aren't getting better. You should also take your child to a doctor if they have a sore throat AND are Māori, Pacific, or prone to strep throat infections. Strep throat needs to be treated with antibiotics to help to prevent rheumatic fever. Seek medical help immediately if your child has any symptoms of meningitis. A poster from the US health agency, showing how to cough and sneeze in a way that stops germs from spreading. Posters and flyers also available in other languages, including Chinese, Vietnamese, Tagalog, Arabic, Samoan, Farsi and Somali. Poster with photos, showing correct hand-washing technique. You can also order this as a sticker. Information from the United States version of KidsHealth about colds in children. Ministry of Health information about the symptoms, treatment and prevention of colds. Information about viral induced wheeze in children including how it's treated. 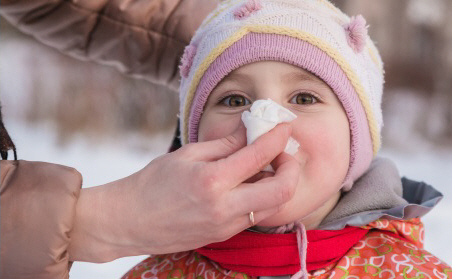 General information about colds, including information about giving cold medicines to children. Written by HealthInfo clinical advisers. Last reviewed May 2016. Last updated January 2019.